Arginine is an amino acid, which is very effective when it comes to boosting an athlete’s performance. Moreover, it proposes an essential need for regulating many body function include heart, immune system etc. The amino acid also plays an important role in healing during intensive workout. Plus, it is also has involvement in the secretion of growth hormones. It gives body builder “the pump” thus ultimately helping them to improve strength and endurance for heavy weight lifting. On a side note, it also increases the sperm counts. Quick healing after a heavy workout session is what makes L-arginine admired by bodybuilders and athletes across the globe. If you are also looking for L-Arginine supplements, then don’t look any further. Get it on Bravo Nutrition. Bravo Nutrition is the leading figure in the online supplements industry with a good inventory of branded supplements from across the globe. We are adored by our customers because of our genuine products and rapid delivery service. We change stereotype mentality towards online shopping by offering cash on delivery and money back guarantee. So, get your L-Arginine supplements at your doorstep by placing your order only at BravoNutrition. Supports vasodilation to allow for more blood flow, which means more oxygen & nutrients rushing through your system. 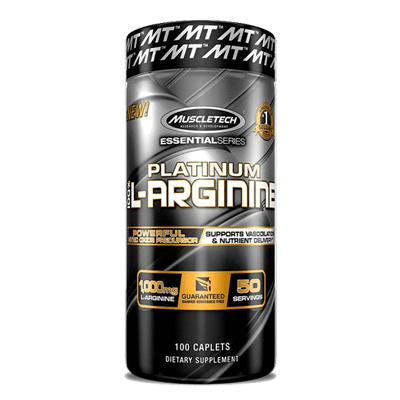 1,000mg of L-arginine is the precursor of nitric oxide. Experience intense pumps & better recovery.